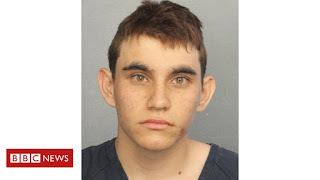 Newsgur USA: School Shootings: Mental illness or gun control? School Shootings: Mental illness or gun control? President Trump addressed the nation after Wednesday's Florida school shooting that left 17 people dead, and expressed that no child or teacher "should ever be in danger in an American school." Nevertheless, the US leader focused more on the problem of mental illness than in the yet-to-be-dealt-with issue of strict gun control. After the shameful events of the Florida school shooting, the president of the United States spoke from the White House, and stated that is "not enough to simply take actions that make us feel we are making a difference, we must actually make that difference." However, the controversial leader did not offer more details or referred to a much needed stricter gun control laws in his remarks and instead steered the issue to mental illness. When Mr. Trump said: "No parent should ever have to fear for their sons and daughters when they kiss them goodbye in the morning”, he was being empathetic, or at least, trying to be. However, he forgot to be practical. Trump promised to visit Parkland, where the shooting took place, and meet with local officials and families. Trump reminded everyone on Twitter that there were "so many signs that the suspected Florida shooter was mentally disturbed. He noted that the suspect has been expelled, writing that "neighbors and classmates knew he was a big problem" and encouraged people that they: "Must always report such instances to authorities, again and again." So much for being compassionate and understanding of the moment. Broward County Mayor Beam Furr told Morning Edition on Thursday that the suspect had been a client at mental health facilities. The FBI said Thursday that, after receiving a tip in 2017, it had investigated a YouTube comment that stated: "I'm going to be a professional school shooter." However, Special Agent in Charge Rob Lasky said at a news conference that after reviewing thoroughly, the bureau was unable to identify the user. Although Trump seemed worried about the shooter being "mentally disturbed," he signed a Republican bill last year that makes it easier for people who are mentally ill to buy guns. "If a specific individual is likely to be violent due to the nature of their mental illness, then the government should have to prove it," said Sen Chuck Grassley, a chief supporter of the legislation. Attorney General Jeff Sessions directed a Justice Department policy unit to work with other federal agencies "to study the intersection of mental health and criminality and identify how we can stop people capable of such heinous crimes." All nice words, but just that. Only Treasury Secretary Steven Mnuchin called on lawmakers to address gun violence. "I will say, personally, I think the gun violence — it's a tragedy what we've seen yesterday," he told a House panel, "and I urge Congress to look at these issues."